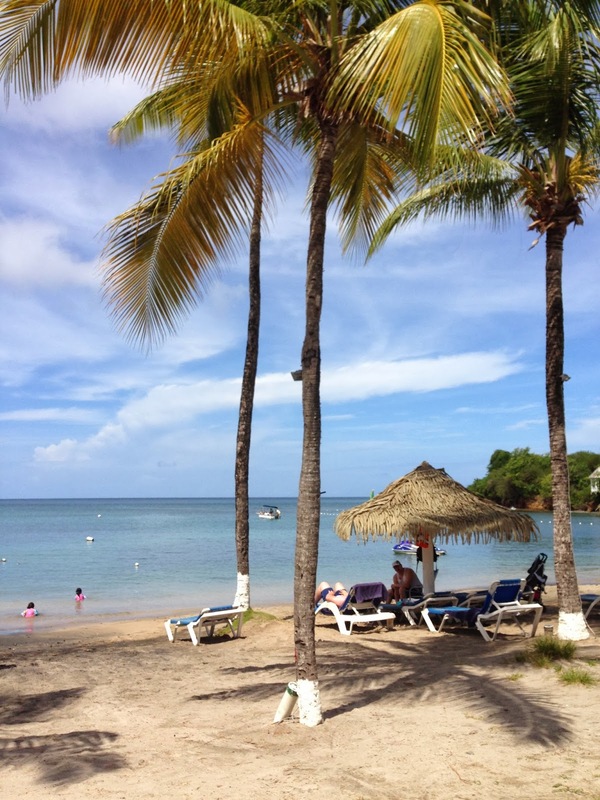 Located on the northern coast of Saint Lucia, Smugglers Cove is a 4* all-inclusive family friendly resort which offers a range of facilities including 7 swimming pools, private beach, water sports, spa, kids club and much more. Smugglers Cove has a lot going for it, but has the potential to be so much more than it is. For me the size of the resort is perfect, not too big and not too small. I hate it when I have to walk 10 minutes back to my room just because I’ve forgotten something. This is also to do with the location of your room obviously. We stayed in the ‘Canaries’ village which is located close to the reception area. All the rooms are split into villages named after towns in Saint Lucia. So there is Soufries, Dennery, Anse La Raye and so on. I will start with the most important thing – Food! Food & Drink Being an all-inclusive resort, food at the buffet restaurant ‘The Cove’ can get repetitive especially at lunchtime, but you definitely won’t go hungry. Every night is a different themed cuisine, like Oriental, Creolan, BBQ and even an Indian night. There is always a different soup, pasta, rice and fresh fish dish and salad bar every day. Also daily are 1 or 2 different types of roasted meats with gravy plus varying side dishes that go with it such as mash, wedges, vegetables etc. My favourite was the seafood bouillion which was a spicy and tangy soup which had lots of lovely clams and shrimps floating in it-so different from anything I’ve had before, and a Creolan specialty. There are lots of vegetables eaten in the Caribbean which we don’t tend to eat here, such as dasheen, christophene, plantain and yam, which are all high in carbohydrates so good in small doses. The biggest muscles in the world! Once bored of the buffet restaurant, you can book a table at any of the other three A la Carte restaurants-La Trattoria -Italian, Waterside Grill – Seafood & Fine Dining and Cafe Asia -Pan Asian. The Italian restaurant is also open at lunchtimes where you can get take away pizzas and paninis. In the evening they have a simple Italian menu with freshly made pizzas which were a huge hit with the children. The best thing were the gigantic muscles that came with my spaghetti-they were twice the size of British muscles! The Waterside Grill offered a variety of fresh fish served with St Lucian style sides. Both their restaurants are part of the all inclusive dining and have kids menus. We didn’t get to eat at Cafe Asia unfortunately as under 16’s are not allowed. If you’re missing home and have room left after lunch, high tea is served everyday around 4, plus a daily beach BBQ at lunchtime if you just want a quick bite. For drinks, 5 alcoholic and non-alcoholic cocktails are on the menu, but the staff are happy to make you anything really-my children had coconut and banana milkshakes. Kids Club The kids club is really commendable with lots of enthusiastic staff members and a range of scheduled activities throughout the day. For Halloween, my 5 year old daughter enjoyed pumpkin carving, making her Halloween costume and then going trick & treating round the resort. Full marks for effort on the part of the staff. Other activities run by the kids club included Lego & Jenga competitions, face painting, crab searching, hair braiding, painting and lots more. The kids playground has a lot of treehouses and equipment including their own parrot called Polly but my kids weren’t too interested in playing as they just wanted to go swimming. The resort has many pools, 2 of which are adult only, plus a hot tub. The kids pool has a water slide which was alright, but not largely exciting. The main pools are really pretty and spread out through the centre of the resort. The proximity to the beach is what makes Smugglers Cove so special. There is also an infinity pool which over looks the Caribbean sea. Although the beach is not huge, it’s big enough for the number of guests staying at the time. The hotel was not fully occupied so it was never difficult to find a sun lounger-finding one in the shade is trickier. The water is warm and shallow for about 5 metres and then becomes deeper. The tide can come in quite far at times, which can be a lot of fun for the kids who weren’t expecting such waves. But generally the sea is calm and safe for small children to mess about in. Watersports Most watersports are free such as water skiing, snorkeling, kayaking and pedalos where all equipment is provided. Lessons are provided for beginners. You can also go on a banana boat or jet ski for an extra fee. Spa The spa offers your typical treatments, and carries them out really discreetly. I had a coconut body wrap on the last day, which was a wonderful way to end the holiday. Service The service was impeccable from staff members in every part of the resort. From housekeeping to the restaurant waitresses, no request is too big for these guys. They were always happy to serve my family however much mess my 1 year old left behind. Rooms What lets down this resort, are the rooms. Shabby, old and tired looking, a serious re-furb is needed. We had a family room which we paid extra for- it was fairly big but looked unclean. Dirty, chipped tiling and grouting, mediocre fixtures in the bathroom were really disappointing. If you can get past the dire rooms, then Smuggler’s cove is a great place. Distance from airport Another major downside is the incredibly long drive from the airport (which is in the south) to the resort which is at the most northern tip of Saint Lucia. Because the country is so mountainous, the journey takes at least 1 and a half hours but feels much longer after a 9 hour flight. I recommend booking a helicopter transfer at least one way, to take away some of the misery of this journey.